Leading publisher of digital entertainment Telltale Games and Robert Kirkman, the Eisner Award-winning creator and writer of The Walking Dead for his Skybound imprint at Image Comics, announced today a new installment for the best-selling and award-winning The Walking Dead: A Telltale Games Series franchise set to premiere later this fall. The Walking Dead: Michonne - A Telltale Games Mini-Series stars the iconic character from the comic book series haunted by her past and coping with unimaginable loss and regret. The story explores her untold journey during the time between issues #126 and #139. Through this Telltale Games mini-series of 3 episodes, players will discover what took Michonne away from Rick, Ezekiel, and the rest of her trusted group... and what brought her back. Premiering this fall, The Walking Dead: Michonne will be available for download on PC/Mac from the Telltale Online Store, Steam, and other digital distribution services, the PlayStation®Network for PlayStation 4 and PlayStation 3, the Xbox Games Store for Xbox One® and Xbox 360® video game and entertainment system from Microsoft, compatible iOS devices via the App Store, and Android-based devices via Google Play and the Amazon App Store. Players will require at least the first episode of The Walking Dead: Season Two in order to play The Walking Dead: Michonne. Further information about how to access the mini-series will be made available closer to the premiere. "In many ways, Michonne herself is a reflection of the world of The Walking Dead. She is brutal and cold on the outside, but deep beneath what is broken, she remains hopeful, trying to claw her way out of the darkness that surrounds her,"said Robert Kirkman, creator of The Walking Dead. "In our effort to bring the world of the comic and the world of the Telltale series closer together, there is no greater character than Michonne to help bridge that gap." 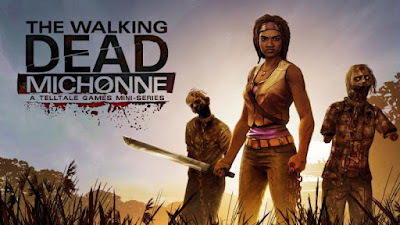 "Michonne's complexity and range make her an ideal lead for the compelling interactive drama fans have come to expect from Telltale," said Kevin Bruner, Co-Founder and CEO of Telltale Games. "With this mini-series, players will experience Michonne's challenges first-hand, and the choices they make will shape her journey. We're incredibly honored by Robert for the opportunity to share this untold story in The Walking Dead universe." To date, The Walking Dead: A Telltale Games Series has sold more than44 million episodes worldwide, earning more than 100 Game of the Year awards from outlets including Metacritic, USA Today, Wired, Spike TV VGAs, Yahoo!, The Telegraph, Mashable, Polygon, Destructoid andGamesRadar, and was also the recipient of two BAFTA Video Games Awards for Best Story and Best Mobile Game. The Walking Dead is set in the world of Robert Kirkman's award-winning comic book series and offers an emotionally-charged, tailored game experience where a player's actions and choices affect how their story plays out across the entire series. For more information on the game, visit the official website, Facebook, and follow Telltale Games on Twitter. For more information on The Walking Dead, Robert Kirkman, and all of his titles, visit www.Skybound.com andwww.TheWalkingDead.com.